The Best-Kept Secret of the Super–Elite Thinkers! I'm about to EXPLODE because you are about to learn what will keep you ahead of the game. Learn How To Use Your Mind to Become the Ultimate Thinker. You are worth it. Saves you a full 23 years of your life trying to figure it out. 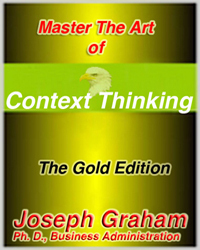 Become a Master Guru of Context Thinking. Discover The Secret To Dynamic and Profitable Thinking! • Showcase your thinking ability, speak and move with confidence and have a future of unrestrained prosperity. Learn the secrets of integrating and organizing information with purpose from one of the world’s unified thinkers. You know good thinking when you see it and now understand why. Invest in this book and think in ways that you are not use to. It will open you to new possibilities and new thinking. We have set out to change the way the world thinks by providing a framework for you to understand the implications and subtleties of your thinking. If you buy one book on thinking – this is it. It will bring you conveniences, time-savings, and pleasures knowing what you need to operate in the Wisdom Economy. Be able to Out-Think, Perform, and Earn the Competition! Save 23 years of trials and errors in getting things done right the first time! Have good, old-fashion basic common sense with time-tested principles! Use these principles to make sound decisions.